While there’s plenty of great, easy to use software such as iMovie to help the cinematic genius in your household edit his or her masterpiece, most of the kid-friendly cameras around are pretty low-quality. 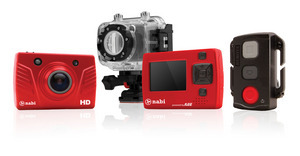 Enter the nabi Look HD, a camera that delivers high-definition movies while withstanding the battering an epic kid’s production dishes out. The Look HD captures full 1920x1080p video and 8 megapixel photos onto the included 32 MB microSD. Better still, is dust-resistant, shock-resistant and water-resistant to 60 meters. The camera comes with a removable, 3” LCD touch display, water-resistant housing, wireless remote, 175 degree wide-angle lens, battery, and two mounts. Sports cameras with similar specifications can cost $100 more, so the Look HD appears to be a great deal (though note, we have not yet kid-tested it). The camera with all accessories is available on nabitablet.com for $169.99.